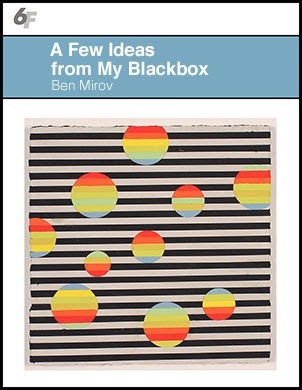 A Few Ideas from My Blackbox, by Ben Mirov (reviewed on HeavyFeatherReview.com), 7/1/16 (Sixth Finch Books, 2016). The Word Kingdom in the Word Kingdom by Noah Eli Gordon (reviewed on EntropyMag.org), 8/13/15 (Brooklyn Arts Press, 2015). Blood Eagle by Adam Crittenden (reviewed on EntropyMag.org), 7/1/16 (Gold Wake Press, 2016).